Compression garments are tight, compressive forms of clothing, often made out of elastin and nylon, which are designed to enhance recovery. The Answer: The Performance Digest. A monthly summary of the latest Strength & Conditioning, Nutrition, Coaching, Recovery, Technology, Rehab, and Youth Development research. GRAB YOUR FREE COPY NOW! Do Compression Garments improve recovery and enhance performance? Compression garments have become a popular item for athletes and recreational gym users, whether that is for their comfort, aesthetical appeal, or for their psycho-physiological function appears to be irrelevant. What is important, primarily for athletes, is their ability to promote recovery and thus improve subsequent performance. The current body of research identifies that compression garments may improve joint awareness, local blood flow, waste product removal, improve running economy, reduce swelling, reduce muscle oscillations, and decrease post-exercise muscle soreness whilst appearing to have no negative impact on performance. However, it is important to acknowledge that this current body of research is of low-quality and riddled with large inconsistencies – meaning the information should be accepted with caution. Nevertheless, as no negative effects on performance have been observed, compression garments remain a recommended tool for promoting recovery and thus influencing subsequent performance. It is also recommended that the compression gradient of the garments are considered and even tailored specifically for each athlete. Competition periods and intense training regimes can lead to exercise-induced muscle damage, which is the cause of the delayed onset of muscle soreness (DOMS). As a result, there has been a substantial growth in recovery-enhancing techniques such as massage therapy, foam rolling, electrical stimulation, whole-body vibration, water immersion therapy, hyperbaric oxygen therapy, and the use of compression garments. Despite this media explosion and widespread acceptance of compression garments as an effective tool for improving performance and enhancing recovery, there is only a small amount of research supporting their usefulness, not to mention the large inconsistencies within this research. However, one research review has demonstrated that compression garments can have numerous physical and psychological effects on performance and recovery (1). The effects of DOMS following strenuous exercise are very well-documented, however, the primary mechanism responsible for this phenomena is still not fully understood. Whilst some believe that DOMS results from the disruption of muscle fibres and surrounding tissues (2), others believe that it is associated with the inflammatory response (3). Perhaps the most realistic theory is that it is actually a combination of both the disruption of the muscle fibres and their surrounding tissues and the effects associated with the inflammatory response (4). The inflammatory response is a process which follows tissue damage caused by strenuous activity. This response leads to an increase in osmotic pressure/swelling, therefore sensitising nociceptors (pain sensory nerves) and causing the sensations of pain and soreness (5). It is thought that wearing compression garments applies external pressure upon the body and thus decreases the osmotic pressure and reduces the space available for swelling and haematoma. A reduction in osmotic pressure may lessen the degree of chemotaxis, therefore reducing the inflammatory response and the experience of pain (1). However, due to a current lack of evidence, this theory still remains somewhat uncertain. In addition to alleged effects of compression garments on inflammatory responses, their impact on the attenuation of creatine kinase has also been substantially explored. Creatine kinase (CK) is a well-understood biomarker of muscular damage (6). In fact, the use of compression garments has been shown to be an effective recovery tool for reducing CK concentration after exercise (1). This reduction in CK concentration has been related to a lessening of CK release into the bloodstream, improved removal of metabolites (waste products), and an enhanced repair of muscle tissue (5, 7). It is suggested that compression garments may improve circulation, potentially by enhancing the ‘muscle-pump’ function, however, this still remains uncertain (7). If this were to be true, then compression garments may result in an increased venous return, facilitating the removal of metabolites, and therefore explain the lowered CK concentrations. 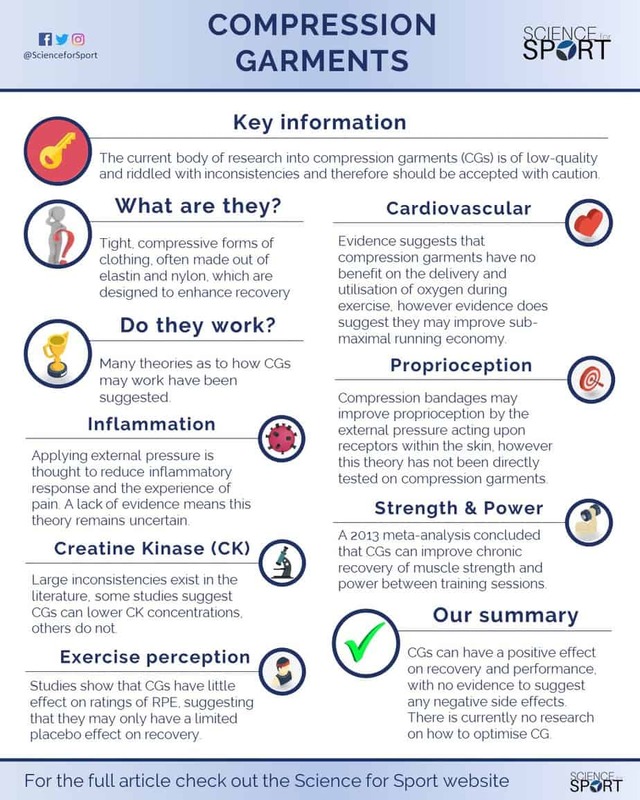 It is important to note however, that there are large inconsistencies in the current evidence – some suggesting compression garments can lower CK concentrations, and some suggesting no change (8, 9). Despite there being a variety of mechanisms thought to be responsible for the reduced perception of DOMS and lower concentrations of CK post-exercise following the use of compression garments, it is shown that muscle strength and power recover quicker with the use of compression garments (1). The impact of compression garments on cardiovascular function has also been well-explored. They have been shown to have very little effect on sub-maximal or maximal heart rate (7, 10), and sub-maximal and maximal plasma lactate concentrations (7, 11). So whilst it is obvious that compression garments have no benefit on the delivery and utilisation of oxygen during exercise, there is evidence to suggest they may improve sub-maximal running economy (12). One study showed that the use of compression garments improved the oxygen cost of running (running economy) by approximately 9% at velocities of 10, 12, 14, and 16 km/h (12). However, as compression garments have been shown to have no effect on cardiovascular response (7, 11), it has been suggested that compression garments may actually improve running economy by increasing proprioception, muscle coordination, and the propulsive force during running (12). Research has indicated that compression bandages may improve joint position awareness (proprioception) by the external pressure acting upon the receptors within the skin, thus enhancing proprioceptive abilities (13, 14). Whilst this is a possibility, to our knowledge, this theory has not been directly tested on compression garments, only compression bandages (13, 14). It has also been demonstrated that compression garments reduce muscle oscillations during dynamic activities such as vertical jumping (15, 16). Reducing muscle oscillations during exercise is thought to reduce muscle fatigue and tissue damage. It is often believed that compression garments can have a positive psychological effect (i.e. placebo) on performance and recovery, by decreasing the individual’s perception of DOMS and their rate of perceived exertion (RPE). As previously discussed, the effects of compression garments on DOMS is still unclear. This recovery method has also been repeatedly shown to have little effect on the ratings of RPE during various running and sprinting protocols (7, 10, 16). This suggests that compression garments may have small, or non-significant, placebo effect on recovery. Compression garments are worn not only to improve chronic recovery (between training sessions), but also as a method to enhance acute recovery (during training sessions). A 2013 meta-analysis concluded that they can improve chronic recovery of muscle strength and power between training sessions (1). However, there appears to be little evidence supporting their ability to enhance acute recovery during squatting, jumping, sprinting and agility tasks (17, 18, 19, 20). Though compression garments may not improve acute recovery during training sessions, it is important to note that no negative effects on performance have been observed whilst wearing them. This suggests that whilst compression garments may offer no additional acute recovery benefits, they are certainly not going to negatively impact performance. Perhaps one of the largest current issues with compression garments is the sizing and applied pressures of the clothing. As the product is typically referred to as a ‘compression’ garment, it would seem obvious that the pressurising effect of the material would be significantly important. Despite this, there is a substantial neglect to mention the pressure gradient of the garment within the current body of research. Of those research papers that did mention the pressure gradient, there are large variances between those gradients, this makes it extremely difficult to draw accurate conclusions. Within the current body of research the typical pressure gradients of compression garments ranges between 10-30mmHg (millimetres of mercury), whilst normal diastolic blood pressure averages around 80mmHg (21). To the author’s knowledge, there is no obvious pressure gradient for optimising recovery. The effects of compression garments on subjective measures of recovery (e.g. DOMS and RPE). Underlying mechanisms responsible for the improvements in recovery. Various pressure gradients and at multiple anatomical locations. Effects on diverse population (e.g. genders, youth, elderly, sporting-level). Optimal duration for wearing compression garments post-exercise. Usefulness of wearing compression garments during sleep post-exercise. It appears that compression garments can have a positive effect on recovery and performance, although there is a lack of knowledge on the best protocol for using this product. Additionally, there is no evidence to suggest that compression garments have any negative impact on recovery or subsequent performance. In response, it is suggested that athletes and recreational fitness enthusiasts continue to use compression garments both during exercise and afterwards as a supplementary tool for improving performance and optimising recovery. With research identifying that compression garments may improve joint awareness, local blood flow, waste product removal, alter sub-maximal oxygen usage during exercise (running economy), reduce swelling, reduce muscle oscillations, and decrease post-exercise muscle soreness, they currently remain an advisable tool for enhancing performance and recovery. However, it is important to acknowledge that the current body of research on this topic is of low-quality and riddled with large inconsistencies – meaning the information should be accepted with caution. Recovery entails many, many topics. By choosing to simply read up on Compression Garments and ignore the sea of other crucial Recovery topics, you run the risk of being detrimental to your athlete’s success and not realising your full potential. To make you an expert coach and make your life as easy as possible, we highly suggest you now check out this article on Post-Exercise Stretching. Owen is the founder and director of Science for Sport. 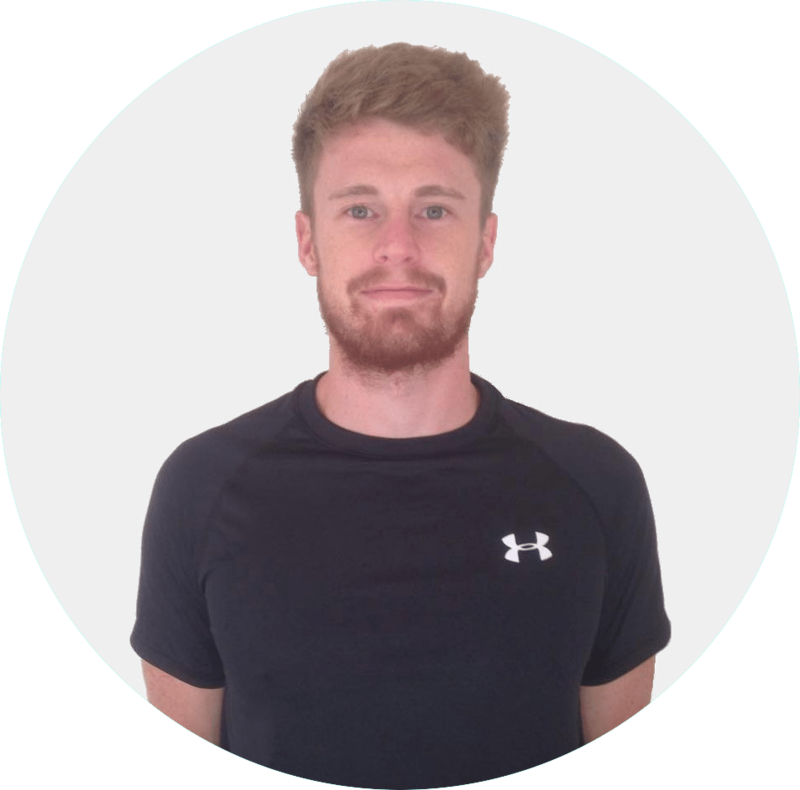 He was formerly the Head of Academy Sports Science and Strength & Conditioning at Cardiff City Football Club, and an interim Sports Scientist for the Welsh FA. He also has a master’s degree in strength and conditioning and is a NSCA certified strength and conditioning coach. If you found this article useful, then please share it with friends and colleagues. Keeping your knowledge up to scratch is an extremely difficult task given the hours and energy needed! But now you can relax, the Performance Digest is exactly what you need! Science for Sport is the World’s #1 resource for all things sports science. 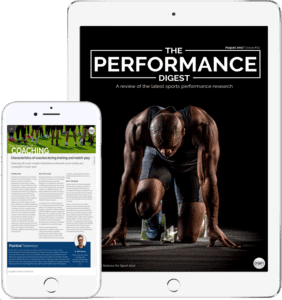 Our aim is to provide high-quality information on all topics relating to sports performance. Our objective is to provide you with the #1 sports performance resource. If there is a topic or service that we do not currently provide, then please let us know. Want to position yourself as an industry expert in all parts of the World? Then join our esteemed team and make that dream a reality. 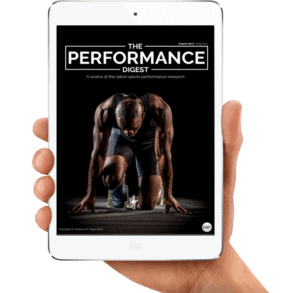 The Performance Digest will take your coaching to the next-level!